What better way to sample our eliquid and save? 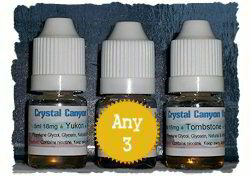 Our sample pack is more economical than purchasing individual 5ml bottles. If you enjoy Tea brewed in the sun then your sure to love this crisp refreshing eliquid! AZ Sun Tea is a lightly brewed tea so its not bitter. Slightly sweetened and a hint of fresh squeezed Lemon added. Baja Juice is our spin on a classic Mojito flavor. We've blended zesty, tangy Lime with a small amount of Mint. This eliquid is balanced with a blend of sweet Blackberry and hints of Coconut. Oranges and Tangerines are blended for the perfect tangy citrus flavor! But its the sweet Cherry and Black Cherries that make this eliquid unique and refreshing! This is our fruit punch blend that's bursting with flavor! Pineapple, Apple, Orange, Guava, Papaya and Passion fruits make up a rich body. A blend of berries adds high tones of sweet and tanginess to this eliquid. is a blend of juicy Cranberries that will make your mouth water together with a sweet and intense Raspberry! We've added a slight cooling sensation (non-menthol) to make this a refreshing flavor. This is our take on the classic Ecto-Cooler! This eliquid is bursting with tangy Tangerine and Sweet Orange. With an authentic citrus flavor, we revived a classic favorite! Sweet tangy pineapple blended with creamy coconut make up this tropical island blend. Similar to a Pina Colada but with a twist - we've added the perfect amount of banana! This makes Islander a smooth, creamy and sweet eliquid you can enjoy any time. a fresh blend of Valencia and sweet Mandarin oranges to bring together both a tangy citrus flavor with just the right amount of sweetness. Southern Chill is a blend of sweet and tangy Strawberries with a home style Lemonade. The Strawberry compliments a bright citrus flavor giving you a sweet and tangy vape! is a tropical fruit punch blend thats sweet, tangy and bursting with fresh fruit flavors! Blended with a zesty, crisp limeade that really makes this eliquid flavor pop! Urban Lemon is a crisp refreshing summertime favorite! Sweet sugar and freshly squeezed Lemons come together in this balanced citrus blend. is a sweet Pineapple juice complimented by tangy Orange and Strawberry! When these well balanced flavors come together you have a sweet and tangy tropical fruit juice unlike any other eliquid flavor! This blend features our rich Cappuccino with a hint of Caramel and Cream to round it out. Together with a slightly sweet, intense, Peppermint flavor this blend really satisfies! The Peppermint comes thru strong at first and the Cappuccino then takes center stage. Our unique, rich Cappuccino is topped off with sweet, creamy Caramel for this bold and sweet blend. A perfect blend of Peppermint and rich Mocha. We have used our signature Cappuccino and Coffee to provide a warm body for this eliquid. The Peppermint is slightly sweet and is well balanced with a smooth, creamy, rich Mocha flavor. Our signature French Roast blend of coffee is paired with rich semi-sweet Mocha. This blend offers a true coffee flavor with the right amount of Mocha to smooth out any sharp notes. We've blended our signature French Roast coffee with our Cappuccino to bring you a bold authentic coffee flavor. While unsweetened, its not too bitter, yet has a bite. This blend delivers that dark roast flavor perfect in the morning or any time! A rich Coffee flavor blended with smooth Dark Chocolate and layered with a bright Tobacco. Brace yourself for Vertigo! is a blend of a slightly sweet, creamy Butter Rum and rich Caramel that gives you a smooth buttery rum flavor! Complimenting this ejuice blend are roasted Hazelnuts and Macadamia nuts for a warm bold finish! is a blend of Raspberry, Semisweet and Sinful Dark Chocolates with just a drizzle of Sweet Caramel to take away the edge. Our take on a classic Strawberry Shortcake flavor that was blended to be an all day vape! Tangy Strawberries, Pound Cake and just the right amount of whipped cream! A blend of dark Swiss chocolate, semi sweet and milk chocolates. Geneva offers a rich, slightly sweet, cocoa flavor. This eliquid provides a warm cocoa body with nuances of dark chocolate and mocha on the exhale. is a decadent Key Lime Pie created with fresh, zesty Key Limes that burst with a bright, tangy and aromatic flavor! Together with a creamy filling and Graham Cracker crust this is our take on a classic dessert. Smooth, creamy Peanut Butter is generously added into our signature Sugar Cookie blend to create the ultimate cookie flavor. Seduction is a blend of Raspberry, Sweet Cream and hints of Vanilla and Strawberry. When these flavors come together you have a smooth, sweet and tangy eliquid. A crafted blend of Vanilla and smooth creamy Custard that has warm undertones and a rich finish! Topping off this Sinful dessert is a blend of unsweetened Caramel and a Butterscotch drizzle. Chocolate Mint Cookie flavored eliquid. We've blended sweet milk Chocolate and Cocoa to get the perfect Chocolate Cookie taste! Together with a variety of mints that are well balanced, our Chocolate Mint Cookie is then dipped in a light layer of Dark Chocolate. Apple Pie with Caramel. A blend of bright red and green Apples make up this tempting pie filling. Graham Cracker with hints of Brown Sugar and Cinnamon gives you a rich pie crust flavor with drilled with Caramel! Ballistic Berry brings together Wild Blueberries, Tangy Boysenberry and Sweet Strawberry. This is berry bliss! We've perfected this blend so that its balanced between tangy and sweet. Grapevine is a blend of Concord and Monukka grapes for a unique but familiar favorite. It provides a sweet flavor with plenty of body. Finishing off with just a bit of tanginess. Sweet, juicy Watermelon meets a flavorful Strawberry. The Watermelon is light, crisp and refreshing. It is complimented nicely by a sweet and tangy Strawberry. Orchard Creek brings together both delicious Red and Green Apples with just the right amount of sweetness. Blended with our tangy Grape, this eliquid has a unique flavor. Plum Mojo is best described as a "Plum Juice". It has a fair amount of sweetness with a slight tangy bite. A rich, smooth, creamy Banana is complimented with a salty sweet Caramel. Together with just the right amount of Menthol and you have a cool and sweet vape. A sweet and creamy Banana is paired with Wild Blueberry! Wild Blue delivers a rich Banana flavor that is complimented by a delicious tangy Blueberry. A crisp refreshing blast of spearmint with a bright menthol finish. This eliquid provides a great balance of sweetness with that cool and savory menthol taste. If you love menthol and want it extreme, then look no further. Avalanche offers a clean, crisp, intense, and refreshing flavor. This is a smooth, savory Tobacco with just the right amount of Menthol to provide a very satisfying vape! Timber Frost is the perfect blend of fresh Wintergreen and sweet mints. Its blended with the right amount of Menthol for that cool, frosty sensation! A rich blend of semi-sweet peppermint is complimented by menthol. Perfectly balanced to provide slightly sweet, savory, crisp and refreshing flavor. This is a medium flavored Tobacco that isn't too bold or light. Slightly smoky but not too bitter. This Tobacco has warm body with some savory tones to it. Only slightly sweet on the exhale. Our Triple Five blend starts out with a medium flavored tobacco. With just the right amount of dark chocolate, this eliquid finishes with a smooth nutty flavor. A bold nutty tobacco blend of various nuts including Hazelnut and Walnut. a unique tobacco blend that has a bright and crisp flavor and rich aroma. This tobacco has a smooth after taste and hints of chocolate. Beechwood brings together a bright Tobacco with rich golden Honey. This eliquid is slightly sweet and has nutty tones that blend perfectly with Honey and Tobacco. Rum Tobacco with Coconut - The finest flavors from the Caribbean come together in the Black Pearl! We've taken a light Rum and paired it with a bright Tobacco flavor that is smooth and slightly savory. A sweet tobacco immersed in our signature Caramel blend for the ultimate Caramel flavored tobacco ejuice! The tobacco is a blend of robust and sweet tobacco flavors that provide a satisfying vape. Smooth rich tobacco blended with Butterscotch and hints of Caramel. An authentic and slightly sweet tobacco flavor! This smooth rich tobacco was blended to bring you that satisfying crisp, savory tobacco flavor without being too sweet and providing some rich undertones. A complex blend of Turkish and Eastern Tobaccos that come together for a rich smooth blend. We've also introduced some RY4 elements into this eliquid to make it unique! Complimented by a blend of creamy Caramel for just the right amount of Sweetness. Sweet and tangy Blueberry is perfectly balanced with our unique Tobacco to create a sweet and savory eliquid! From the open range Ironwood brings a full, rich, Tobacco flavor. Ironwood comes on strong and finishes with a smooth taste. Only sweet enough to please. We started out with a solid well rounded tobacco flavor, with just the right amount of body and richness. Blended perfectly with creamy Caramel and sweet Vanilla this eliquid goes beyond a traditional taste! Its a smooth, sweeter vape that allows its tobacco notes to come thru. Primoroso is a bright flavorful Cuban tobacco that is very smooth tasting. It has high tones of Vanilla and sweet Hazelnut that compliment this tobacco very well. With a smoky, rich tobacco we've blended the perfect Black Cherry and Cherry Balsam to bring you a sweet and tangy flavor. This a rich blend of tobacco flavors. It has minimal sweetness and is bold and slightly savory. Without being overly complex, this tobacco offers a unique flavor sure to satisfy.